I have been underweight all my life and was constantly teased about how skinny I was. 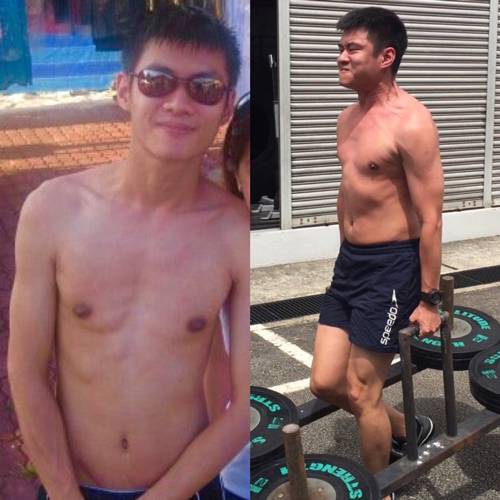 Throughout the years, no matter what exercises I did or how much I ate, my body just didn’t seem to want to pack on muscle. 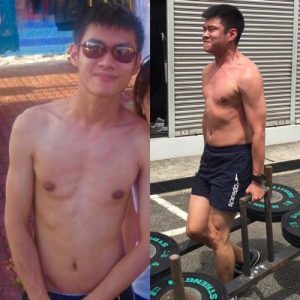 Although some programs I tried worked, the results were minimal and progress stopped after 2-3 weeks. I thought I had done everything possible and was on the verge of giving up. That was when I met Shaun. He introduced me to barbell training and the program that I was to do to achieve my goal. I’ve had exposure to barbells before but what he had me do in terms of exercise technique was totally new. The program he put me on was simple but it was by no means easy. It started out manageable, suited to what I could manage at that point of time but got more demanding as the weeks went by. Coupled with nutritional advise from Shaun, I went from a bodyweight of 64kg to 70kg in just 7 weeks.